We present a procedure for splitting processes in a process algebra with multiactions and data (the untimed subset of the specification language mCRL2). This splitting procedure cuts a process into two processes along a set of actions A: roughly, one of these processes contains no actions from A, while the other process contains only actions from A. We state and prove a theorem asserting that the parallel composition of these two processes is provably equal from a set of axioms (sound and complete with respect to strong bisimilarity) to the original process under some appropriate notion of synchronization. We apply our splitting procedure to the process algebraic semantics of the coordination language Reo: using this procedure and its related theorem, we formally establish the soundness of splitting Reo connectors along the boundaries of their (a)synchronous regions in implementations of Reo. Such splitting can significantly improve the performance of connectors as shown elsewhere. Jongmans, S.-S.T.Q, Clarke, D.G, & Proença, J.M.P. (2014). 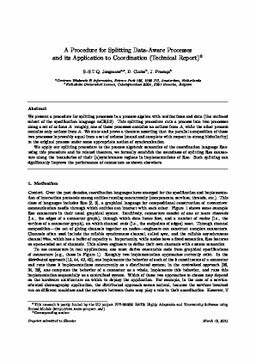 A Procedure for Splitting Data-Aware Processes and its Application to Coordination (Technical Report). Formal methods [FM]. CWI.